Director Darren Aronofsky is a unique beast in Hollywood. A filmmaking auteur, his five films have been wildly different but always exceptionally challenging and distinctive. With Black Swan, a remarkable experience in psychological horror, his work continues to evolve in this way. 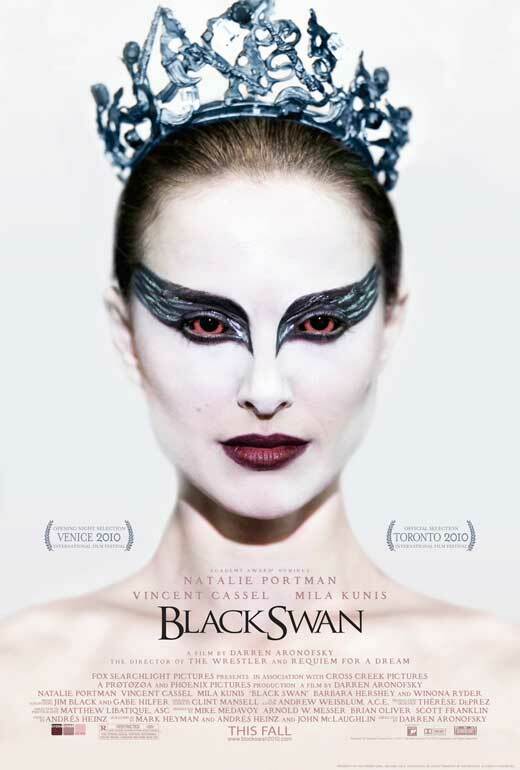 In short, a young New York ballet dancer, Nina Sayers (Natalie Portman), is given the chance to live her dream portraying the “Swan Queen” in a performance of Swan Lake under the demanding, watchful eye of revered director Thomas Leroy (Vincent Cassel). Overwhelming pressure from the ever growingly closer performance, her obsessive mother and guilt of stepping into the place of Beth Macintyre (Winona Ryder), a once beloved performer now shunned by Leroy, takes its toll and Nina slowly descends into hallucination and extreme behaviour. What becomes clear early on is that the film’s narrative is Swan Lake, making Black Swan, the movie, an achievement perhaps to overwhelming to comprehend after just one viewing. Aronofsky settles into a familiar Wrestler-Esq pace, with slick cutting and handheld camera leading us into an authentic atmosphere of the ballet world, each actor convincing as literal dancers (no doubt some are real professionals) more than just comfortably belonging in background. Portman herself is truly convincing in the role of her lifetime. Plenty can be said for the excellent support players (including Mila Kunis and a perfectly cast Barbara Hershey), but Aronofsky is an actor’s director after all, and his leads all seemed to have offered little resistance to the remarkable challenge he sets for them (four of them have received best actor Oscar Nominations). Portman is no exception. Having always viewed her as talented but with perhaps an unfortunate young adult stigma, in Swan she finally transcends beyond that with a role equally draining emotionally and physically. It’s an almost surprisingly exceptional performance reaching extremes of madness and menace. What shouldn’t be denied about Black Swan is that it is a horror film. Long suffering fans of the genre are subdued with examples these days of usually pointless exercises in gore exploitation or cheap thrills designed to shock, but always fail miserably. Rewards do come to the patient however and the film teeters between genuine scares and skin crawling imagery, like all good horror should. Some moments are so disturbing, that mixed amongst the grace and intensity of the ballet, I wonder when was such a glorious example of the genre last achieved? Recalling and clearly influenced by the earlier films of David Cronenberg and Giallo maestro Dario Argento, Aronofsky has fortunately not shied away from snapped limbs, peeling skin and body manipulation. Amongst all the well achieved suspense; using mirrors and doppelgangers to freak us out, lays the sublime cinematography. Tight close ups are the order of the day, including during the dance sequences which adds even more authenticity. The finale of the performance and all that transpires is remarkably fluid with a certain moment with Nina that had me picking my wannabe-director jaw off the ground. The final winning element is the enveloping score from long time Aronofsky collaborator, Clint Mansell. Embracing the orchestral moments of Swan Lake amongst original material, the increasingly dreadful vibe of Nina’s world would not be so intense if not for Mansell’s work. Swan is a darkly sexual, extraordinary film that I couldn’t recommend enough, though it does come with a warning; it is not for the faint hearted. What I love the most is that the truly unique Aronofsky has continued to produce work that is challenging and flat out technically brilliant, allowing his influences to seep in as if only to say, I love these kinds of films, and here’s my drop in the bucket. What he has actually given us is one of the best horror films in years and another performance that raises the bar for intensity. Best director working today? Here is merely just another exhibit for the courts. Another awesome review. This was a "maybe" film for me, After reading this it has changed to a "must see". Great Work once again. Hey man. Been away from the blog a while, so didn't realise you commented! Thanks for that. Have you seen it yet? What did you think? Not sure how it will hold up for me on a second viewing, but looking forward to it when the time comes (on Blu-ray).